We've been out of the action for a little while here in the blog world, because we've been out of the action in the kitchen too - we didn't cook for an entire week. We went to the East Coast to spend Passover with Michael's family in New York and Connecticut, and were completely spoiled food-wise. First, there was a lovely dinner in Brooklyn with friends of mine from college and their husbands, then there were many bagels (one for breakfast and one for lunch - what a versatile food!) and black and white cookies. There was a very strange day when we drove to Philadelphia to see another friend and were stuck in traffic for an hour on the New Jersey turnpike because there was a bear in a tree. Then we got word that we couldn't eat the legendary Lucali Pizza, our plan for dinner that night, because the owner and pizza maker had been stabbed that day, apparently because of an argument over a woman. Don't worry, though - apparently he's okay and will be back making pizza soon, and we got our pizza fix in at Lena's First and Last Pizzeria in Hartford. Oh! We also made it to New Haven to visit one of my college favorites, Ivy Noodle, whose curry chicken noodle soup with chow fun I dream about and have not been able to find a replacement for in the Bay Area, or anywhere outside of New Haven. But enough with the bagels and the pizza and the noodles. 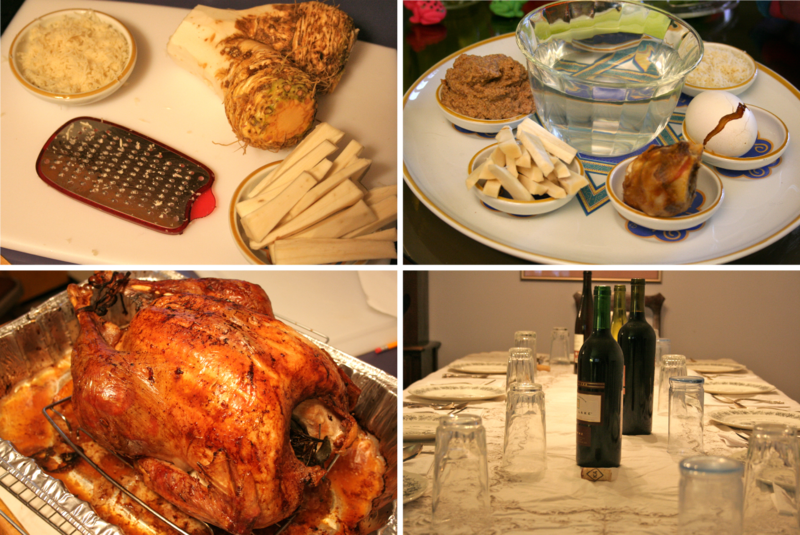 You want to know about the Pesadik (foods that are kosher for Passover) stuff, don't you? The Seders take place on the first two nights of Passover. The first night, we went to New York and had a fun and raucous Seder with twenty people at Michael's aunt and uncle's apartment. The second night was a little calmer, with eleven people at Michael's parents place in Connecticut (including our dear friends, Kim and Joel). This was in fact my first time attending a Seder; Michael has gone back most years since moving to California but it just hasn't worked out with my vacation schedule until now. For those unfamiliar with Passover, it's the Jewish holiday commemorating the escape of the enslaved Israelites from Egypt. There's a lot of symbolism, a good bit of singing, a lot of discussion, and a lot of food. 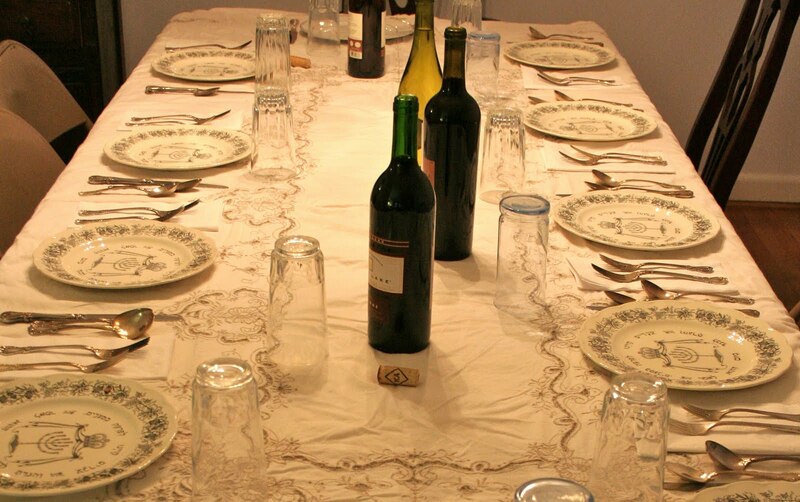 There are four cups of wine to be consumed throughout the course of the night, and everything happens in a very specific order - in fact, seder literally means order. There is not, however, anything made with leavened flour, because the Jews had to leave Egypt in such a hurry that they didn't have time to let their bread leaven, so eating matzah is a reminder of the exodus (see? I told you about the symbolism). This presents an intriguing challenge for Passover cooks: desserts without flour. We'll get to that. One very important part of the seder is the seder plate, heavy with symbolism - maror (horseradish) represents the bitter times of slavery; charoset (a rather tasty blend of apples, spices, and nuts) stands for the mortar used to build the pyramids; karpas (a green vegetable - in our case it was celery) represents spring time and is dipped in salt water to remind us of the tears of the enslaved people; z'roa (a lamb shank) represents the passover sacrifice; and beitzah (a hard boiled egg) symbolizes, well, that's often the topic of much discussion during the seder. Some of the items on this plate are eaten during the reading of the Haggadah, which is the text that tells the story of the Exodus (there are many, many different editions of the Haggadah, but my favorite was the one put out by Maxwell House, because it has transliterations of the Hebrew so that I could kind of sing along). Oh, and one final note - remember all that stuff I explained above, about what symbolizes what? That's all up for discussion and argument. In fact, that's part of the Seder - let's call it discourse. The level of discourse involved, of course, depends on the Seder and the particular people involved and how long they are all willing to wait before breaking away from the Seder plate into the feast. To argue, or to eat - a very delicate balance! Line 2 or 3 large cookie sheets with foil and parchment. Do not grease. Make sure the egg whites are at room temperature (separate them at least an hour before you intend to use them). Put oven racks in the center of the oven. Preheat the oven to 250. Chop the chocolate chips in the food processor and mix with almonds. Set aside. Beat the egg white in a large bowl until they form soft peaks. Gradually add the sugar, beating while you do so. Add vanilla and salt, and beat until the egg whites form stiff peaks. Very gently fold in nuts and chocolate. Drop mixture by rounded teaspoons onto cookie sheets. You can space them close together – they don’t spread. Fill all the cookie sheets before you put them in the oven (this is important). Place the cookie sheets in the oven. It is best not to open the oven at all but if you must peek do it after about ½ hour. DO NOT open the oven door for the last half hour. After the cookies have been in the oven for an hour, turn the oven off. DO NOT open the door. Leave them in the closed oven over night or for at least 6-8 hours. Handle the cookies carefully - they are fragile. Store in closed plastic bags or an airtight container. I suppose they would keep for a few days but they’ve never lasted very long. Thank you for a wonderful and informative post. It's one of those things (being non-Jewish) that you always wonder about but never take the time to research on your own. And the Tsimmis sounds wonderful... I may have to make that one on my own! Thank you for your comment and we're glad you enjoyed it! Tsimmis was my favorite part of the whole thing (well, a close tie with the meringues, maybe) - you should definitely try it out!